Wells Falls on Six Mile Creek in Ithaca, New York. Nikon D700/28-300VR, f/22, ISO 200, EV 0, 28mm focal length, HDR Image. 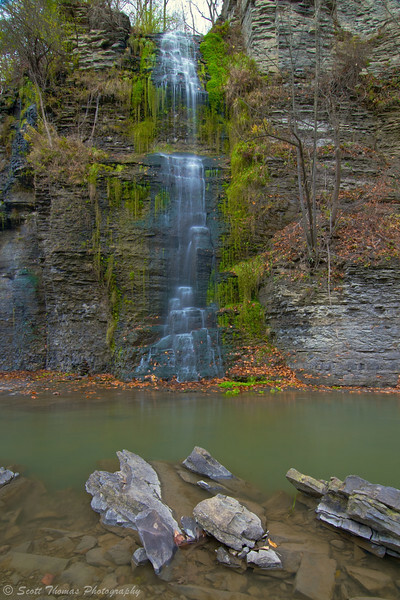 Ithaca, New York is known for its gorges and waterfalls. Some are easy to get to like Ithaca Falls. Others, like Wells Falls, takes knowledge of the maze of Ithaca roads which wind around the gorges, creeks and Cornell University. Luckily, I had two very capable guides in fellow blogger, Debbie of My Life in CNY, and Andy Williams. Even in this age of GPS gadgets, I doubt I would have found Wells Falls without their help. The trail to Wells Falls is well marked and groomed but very steep. The climb down (and later back up) is worth the physical effort. Wells Falls is below an old hydroelectric dam with the remnants of the dam’s power station decaying to the side. The day was perfect for photographing waterfalls yesterday being overcast with a nice even and diffuse light. Unless I wanted the sky in a photo. Then I decided to use High Dynamic Range (HDR) to capture the scene you see above. It took 7 bracketed photos from -3 to +3 stops to cover the range of light from light to dark. I processed them with Photomatix Pro Plugin for Aperture 3 and gave it a darkened textured look. Down the creek a bit from Wells Falls was a Man created waterfall which is not always flowing. The water comes from a drainage pipe above the gorge. Though not present during dry periods, the passage of Hurricane Sandy earlier in the week was still producing a steady flow of water. The lighting and lush vegetation surrounding it produced a rich and lush looking photograph. Un-named waterfall along Six Mile Creek in Ithaca, New York. Nikon D700/Tokina 11-16mm, 2s, f/16, ISO 200, EV 0, 16mm focal length, tripod. I could not find a name for this waterfall and my companions did not know if there was one. If you know it, please, put it in a comment below. TIP: I used a polarizer filter to eliminate the reflections on the water and wet leafs. 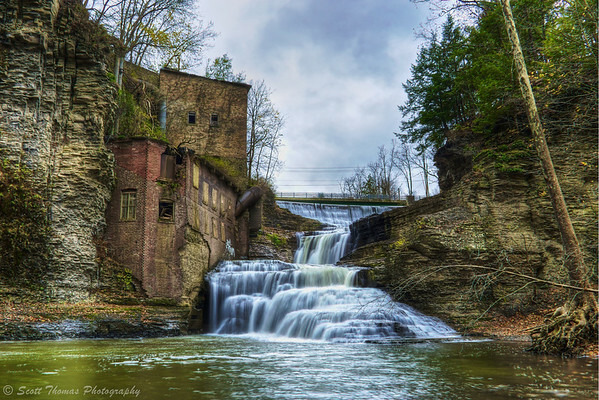 This entry was posted in Nature, Weekly View and tagged 28-300mm, creek, dam, decay, filter, green, hdr, hydroelectric, ithaca, new york, nikon D700, old, photomatix pro, polarizer, rocks, six mile, station, stone, trees, tripod, vegetation, vr, water, waterfall, wells falls. Bookmark the permalink. Great image of Wells Falls Scott. Well done HDR! Thanks, Mike! Considering I drove through snow on the way there and back, the weather in Ithaca turned out to be just about perfect for waterfall photography.